This app note shows you how to set up the miniDSP UMIK-1 and Room EQ Wizard (REW) on the Mac, together with a device with HDMI input such as an A/V receiver or a miniDSP home theater processor. This enables you to select individual output channels for use in measuring and equalizing a home theater or multi-channel surround system. You can use a Mac with an HDMI output port or a Thunderbolt port. This app note assumes that you have already downloaded and installed REW. 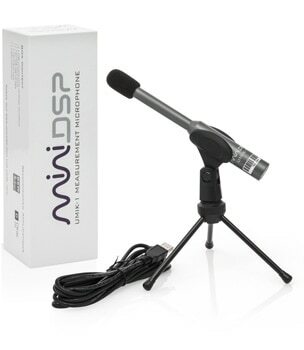 Mount the UMIK-1 into a microphone stand. For home theater applications, it's easiest to point the microphone at the ceiling and use the 90-degree calibration file. Connect the UMIK-1 to your Mac with a suitable USB cable. Connect your Mac to a suitable HDMI input of your A/V receiver or miniDSP home theater processor. If using a Mac with an HDMI output port, you can use a regular HDMI cable. If using a Mac with a Thunderbolt port, you can use a Mini DisplayPort to HDMI adapter cable. Check that your receiver is set for multichannel output e.g. 5.1 or 7.1, and not to a stereo downmix. The photograph below shows a MacBook Pro connected via the Thunderbolt port and adapter cable. Double-click on the REW app to run it. You will see a screen asking if you want to use the UMIK-1. Click Yes. Set Output Device to the HDMI output device. You will hear a sweep through the front left speaker, and REW will display its first frequency response graph. Repeat for all channels by clicking on the Measure button and changing the channel selector each time to 2, 3, and so on. We recommend that you change the name of each measurement as you go to keep track of which is which. After completing all channel measurements, you can view them together in the Overlays window.